Since 2010, the Yiddish Book Center’s Wexler Oral History Project has recorded more than 600 in-depth video interviews that provide a deeper understanding of the Jewish experience and the legacy and changing nature of Yiddish language and culture. The interviews in the growing collection are conducted in Yiddish and/or English with narrators of all ages from a variety of backgrounds. Fyvush Finkel, the beloved comedian, actor, and singer who died in August, was interviewed by Christa Whitney on October 23, 2014 in New York. 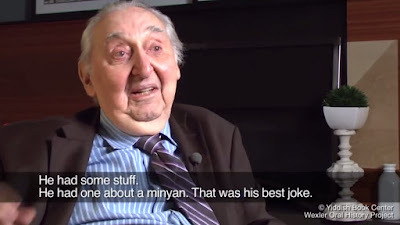 Finkel reminisced about how he inherited his grandfather's sense of humor and retold his grandfather's favorite joke -- all in Yiddish (with English subtitles). It is so wonderful to hear Yiddish. Thank you for sharing.